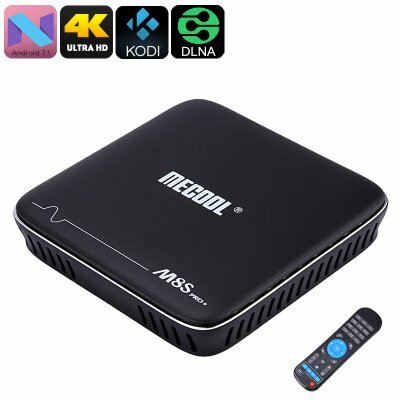 Successfully Added MECOOL M8S Pro Android TV Box - Android 7.1, 4K Support, Quad-Core, 2GB, DLNA, Miracast, Airplay, Google Play, Kodi 17.0 to your Shopping Cart. Throw the ultimate movie nights for all your friends with the MECOOL M8S Pro TV Box. This Android TV Box supports 4K resolution thanks to which you’ll be able to enjoy all media in stunning quality. Simply hook it up to your TV, connect it to the web, and enjoy all features it has to offer. With access to the Play Store, this 4K TV box provides you with an unlimited source of free entertainment. You’ll be able to play games, watch movies, or simply browse the web. This Android 7.1 TV Box brings along countless hours of free entertainment for you to enjoy. Whether you like to spend a relaxing evening at home with the family, or play games and watch football with your mates – this Android TV box will handle it all. Thanks to its 4K support, this Android TV box truly lets you enjoy a cinematic experience. Grab yourself some popcorn and sit back enjoying the latest movies. With this 4K TV box at your side, you’ll never need to visit the theater again. Besides Google Play, it also comes with Kodi 17.0. This software provides you with even more free to download media and entertainment to enjoy on your big screen TV. It comes with 16GB internal storage and a 32GB SD card slot. Thanks to this, you’ll have all the space needed to store your games, files, and media. By supporting DLNA, you’ll furthermore be able to easily share files in between different devices. The MECOOL M8S Pro TV Box runs on the latest Android 7.1 operating system. This will allow you to enjoy the latest software without experiencing any lag. It furthermore comes with a sophisticated Quad-Core processor that has been clocked at 2GHz. Along with its 2GB RAM, this piece of hardware provides you with enough power to tackle demanding Apps and games. No matter what type of media you throw at this Android TV box, nothing will slow it down. It supports both Miracast and Airplay. With this, your 4K TV box allows you to mirror all that’s happening on your mobile device straight onto your TV.